Jonathan Franzen arrived late, and last, in a family of boys in Webster Groves, Missouri. 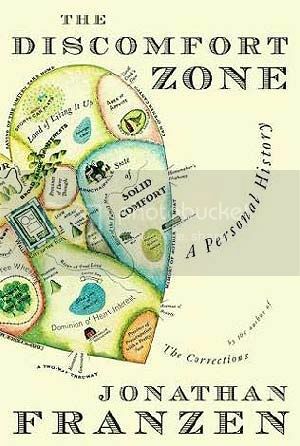 The Discomfort Zone is his intimate memoir of his growth from a "small and fundamentally ridiculous person," through an adolescence both excruciating and strangely happy, into an adult with embarrassing and unexpected passions. This was my first foray into Franzen, and I didn’t enjoy it at all. I will, however, give him huge benefit of the doubt as I have heard lots of good things about his fiction. This was, unfortunately, non-fiction - a less than 200 page account of his life. It was excruciatingly dull, and I have to admit I skipped the last twenty pages. It did begin strongly with Franzen selling his mother's house and reflecting on his life to date. I liked his little allusions to the past, and how they were slightly disjointed. We then delved into tales from a church group Franzen was part of during his teenage years, which was interesting in places. Then came a great deal of chit-chat about American politics and bird-watching. I blame myself for becoming distracted during the paragraphs on politics (I'm a bit ignorant of such matters), but the bird-watching part I just could not fathom. It didn't seem to have any link to anything that had happened previously. Where did this love of birds come from? Didn't I just read a few pages ago that Franzen wasn't interested in animals? Or did I make that up because my eyes were so glazed over from reading this drivel? Following the excitement of bird-watching, Franzen seems to skip forwards in time a great deal. We don't see him meeting his wife, but all of a sudden she leaves him and he begins to deal with this. This is where I gave up. I was so lost, so confused, and so apathetic about the rest of his life that I couldn't go on any longer. I have The Corrections on my shelf and I've heard so many good things about it. It won an award! I really think these memoirs weren't the best way to begin immersing myself in Franzen. I’d have loved to have done a longer, more detailed review on my distaste for the book, but I really have to put it behind me. I want to say don't read this book if you are a Franzen virgin like I was, but instead I will say don't read this book at all. 10 / 50 books. 20% done!